Now that some time has passed since the commemoration events held in Istanbul, I can finally freely post some photos and also part of the journal I was keeping at the time. Firstly, I should say that the events planned by Project 2015 were phenomenal. They were brilliantly organized and executed. The organizers were gracious and caring to all the attendees, and they were well prepared for the days’ events. I unfortunately was not in Istanbul to attend the legendary memorial concert on April 22 featuring Onnik and Ara Dinkjian among other fine musicians, but from what I understand it was a moving performance (and apparently is on YouTube). It was my first trip to Istanbul, and it was without a doubt one of the greatest adventures of my life. 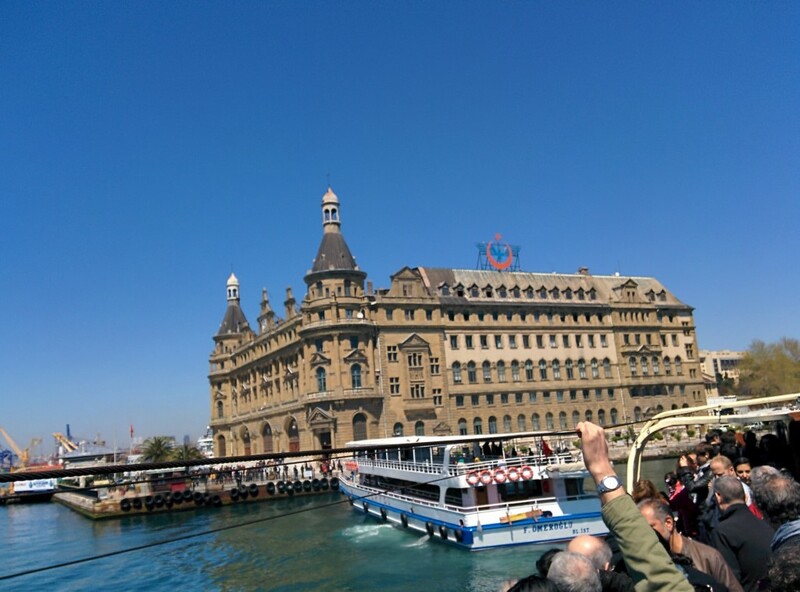 As you’ll see in photos I will post soon, Istanbul is a colorful, dynamic city where nothing seems to be impossible. Although I primarily spent all my time there in the Beyoglu district and also the Golden Horn, I felt a peculiar, indescribable bond with the city, as if I had been away for several decades. 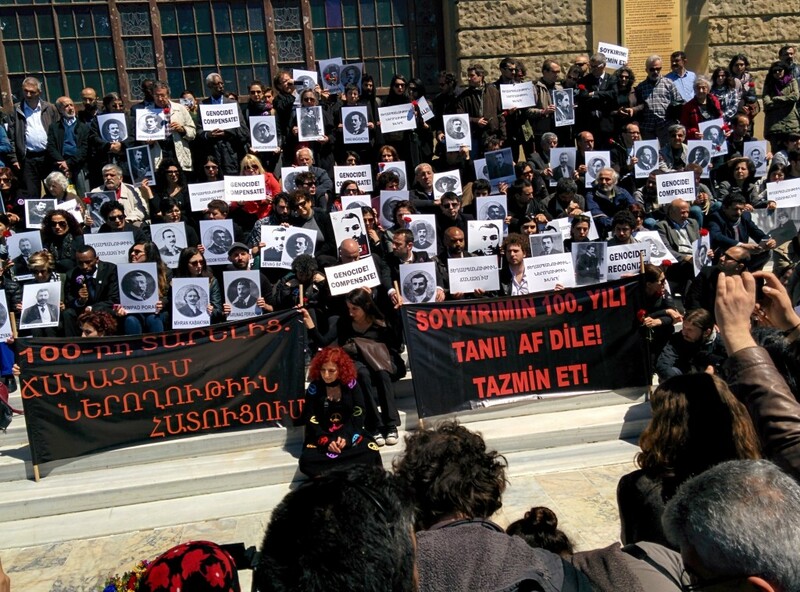 For many years I vowed to never set foot in Turkey, not until the government recognized the Armenian Genocide. But some time ago I started getting over that. I realized that regardless of anything, Turkey–Western Armenia–is the home of my ancestors, and whether the Turks acknowledge the genocide or not, my roots are still there. That land is awaiting me. I did not feel that there was anything relevant for me personally in being in Yerevan for the 24th. Nothing compelled me to march up Tsisternakaberd once again, droopy tulips in hand. The centennial was an event, it was a milestone, and for countless others like me, something had to be done differently this time around. I had heard one argument that by choosing to commemorate the centennial in Istanbul people were looking back in time instead of forward. I disagree. 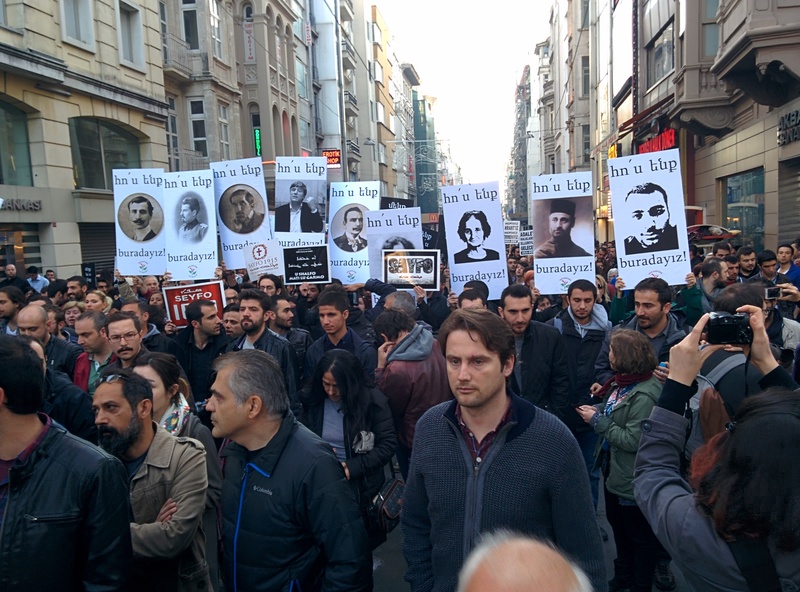 There was no other place on earth more symbolic for holding Armenian Genocide commemoration events than Istanbul. Below are my notes recorded at the end of that day. The day was an emotional one. It wasn’t depressing for me, however. Perhaps that’s because I was caught up in the shock of being here. Yesterday as I debarked the airplane at Ataturk Airport a strange thought came to my head — was I home now? This musing was ironic since I had arrived from Yerevan, my home for 10 years. It’s where my children were born. But my roots are in Anatolia, not the South Caucasus. So was I home? Does it matter that I have no family ties to Constantinople? How does my identity as an American factor into this? This question was reinforced by other feelings, emotions that I wanted to subdue yet they were there, cacophonous in the soul but somehow latent. It started late in the evening and continued this morning. I contemplated that I was looking for a connection with my past in the wrong place all these years. It’s as if I was deceiving myself. My ancestral home is indeed Anatolia. It’s not Yerevan, it’s not anywhere in the Armenian republic. I still feel the need to go home. Yegheki is waiting. Sousoury is waiting. Urfa is waiting. These places are all expecting me, I sense it, I can even taste it. I’m almost there. I’m looking for the right time to go, with the supportive companionship I will undoubtedly need to have. I can’t take that trip home alone, not the first time there. It was a full day of visiting historic locations from mid-morning to late afternoon, from the site where Gomidas Vartabed once resided in Istanbul (the original building having been raised decades ago), to the jailhouse where the arrested intellectuals were detained (which is now called the Museum of Turkish and Islamic Art) to the Haydarpasa train station via ferry from where these same intellectuals were sent by railcar to their doom. 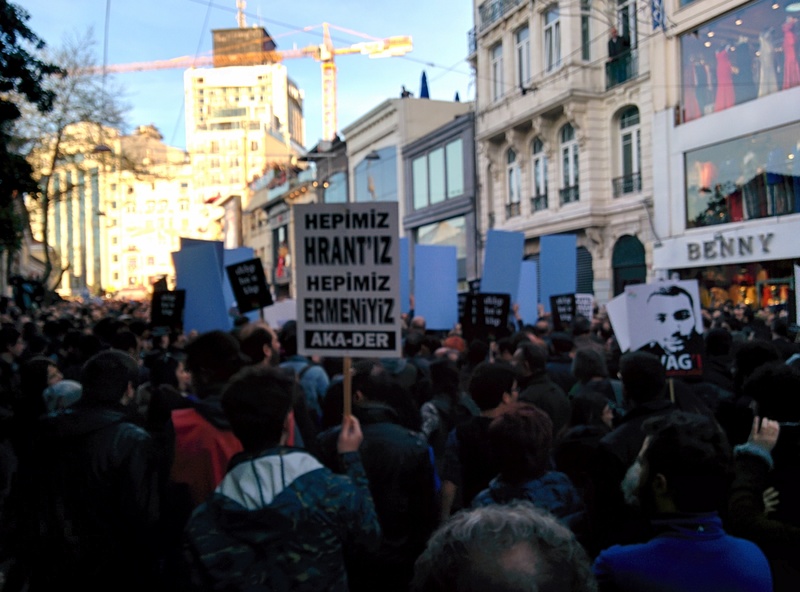 At 6:30 pm I set out for the site that is sanctioned for the protest adjacent to Taksim Square on Istiklal Street, but I decided to bypass it and walk up Tarlabasi Street instead, then left onto Zambak. 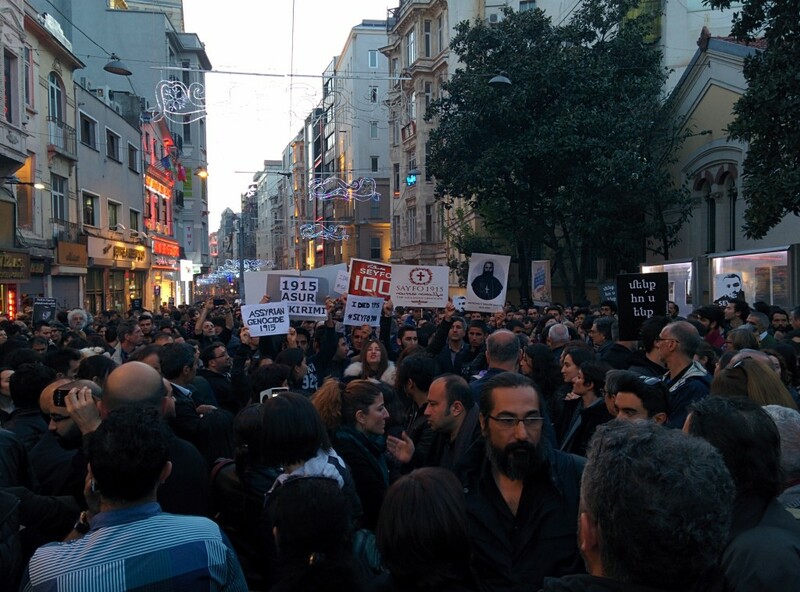 At the Zambak-Istiklal intersection I met a barricade of police. Men and women in full riot gear were on the sidelines, preparing for the worst. 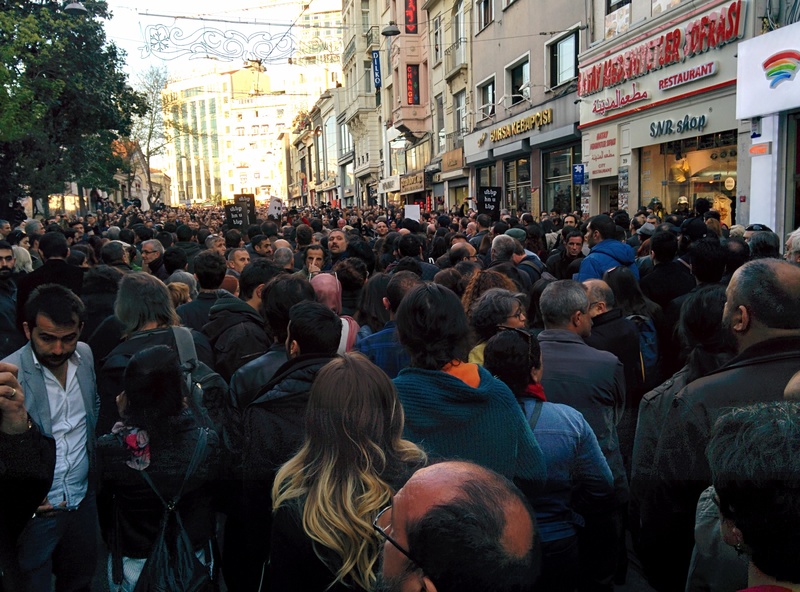 There was a rumbling chant in the distance coming from far down Istiklal Street. What appeared to be hundreds of people (close to 5000 protesters assembled that evening) were already gathered for the protest but there was no way of getting to them; the policeman told me the area was “closed.” I walked all the way around the block via a side street I luckily managed to discover only to be told on Taksim Square that the area was blocked off—the same secure police barrier was there as well. I told a policeman that I wanted to join my friends, that I was an Armenian. He told me to go back to the other side, where I had just been. I rushed back, weaving in and out of the chain of random pedestrians strolling about, clueless of the protest that was about to formally start. When I finally returned the chants were now louder because marchers entered the protest area walking right past me. 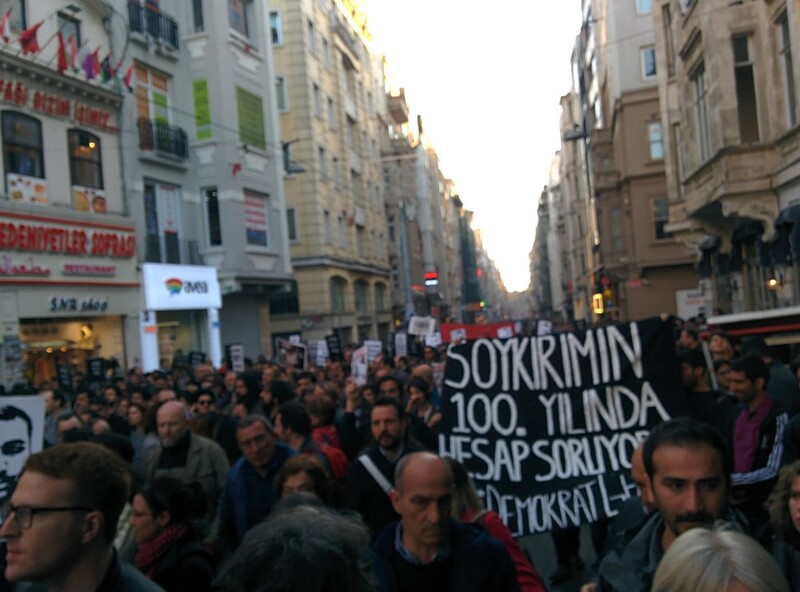 For a moment I stood in fear thinking that Kemalists had managed to enter the area sanctioned for the protest. Then I saw the placards that people were holding and I was relieved. The signs told us not to forget Sevag Balikci, the soldier serving in the Turkish military who was murdered on April 24, 2011. They demanded that the genocide be admitted. I saw familiar faces, close friends nearby. There was a call and response method to the chanting. The power it transmitted was overpowering, exhilarating. It was unlike any protest I have ever participated in—the emotions, the intensity of the moment, the energy transmitted from person to person as if a rolling wave in a calm sea. 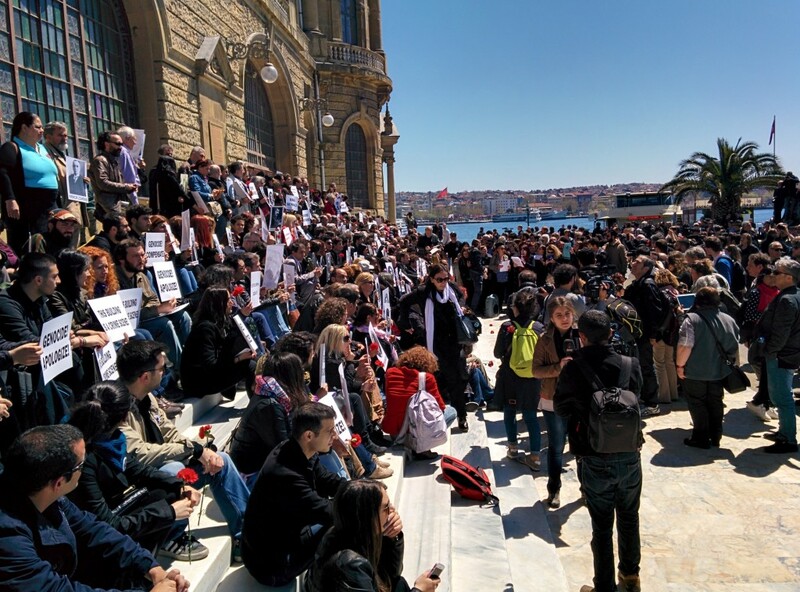 The chanting continued for several minutes before the mass sit-in protest officially began. 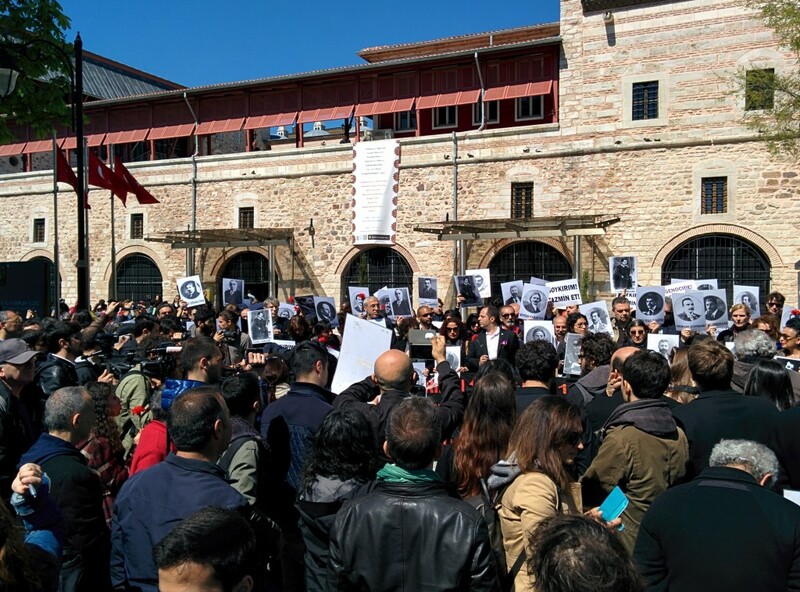 Thousands sat on the brick pavement, listening to speeches being read in Turkish, Armenian and English. Amongst us were Turks, Armenians from Istanbul and across the Diaspora, French, Darfuri. Occasionally recordings of spiritual music performed with modern arrangements were played on the loudspeakers. The mood was solemn; I discerned one woman in particular holding back tears. I wanted to weep but I couldn’t. The chants of the oppositional anti-Armenian protests in the distance kept breaking the mood to mourn. I yearned to weep for my great-grandfather Nishan Guetchudian, who never watched his daughter Clara grow up. There are no photos of him, no traces. It’s as if he never existed. I wanted to imagine my grandfather Hagop surviving on the streets of Aleppo, compelled to eat weeds, picking through gravel and dirt in search of nails or anything made of metal to sell to a blacksmith so he could buy a loaf of bread—or perhaps two loaves, one being a distraction for the dozens of other starving children hovering around him, begging for a morsel. I wanted to imagine how infant Lusine Mahakian, comforted by her mother and her siblings managed to flee Urfa for Syria, sheltered from time to time by acquaintances. But I can’t. How can anyone possibly fathom having to survive an inferno of devastation, slaughter, rot, famine and filth? How do you begin to imagine it all? It’s not possible. You can stare all you want at the photographs of decapitated heads piled up in pyramids of evil, bewildered women roaming while clutching their babes, the gallows where dozens of devastated men sway, emaciated, decomposing children laid tightly beside one another in rows that never seem to end. It’s simply not possible for us to in any way to visualize that hell as if we were there in the moment. And we are better for that. Our martyrs would not want us to imagine it. One hundred years later they beckon us not to forget them, while imploring us to move on. For several weeks now I’ve been trying to put into words what the centennial of the Armenian Genocide means to me personally, and how I am either directly or indirectly affected by that holocaust. Would I have existed had the Genocide not taken place? Is it possible that my grandparents would have met regardless and given birth to my own parents, who in turn would have met either in Western Armenia or in the United States? Obviously, there is no way of predicting destiny and it arguably may be a foolish exercise to even ponder the probabilities of outcome. Perhaps I am being naïve in stating that yes, I do believe I would have been born into this world right around the same time 43 years ago. It is extremely likely that both my grandparents on my mother’s side for instance would have wound up in America. 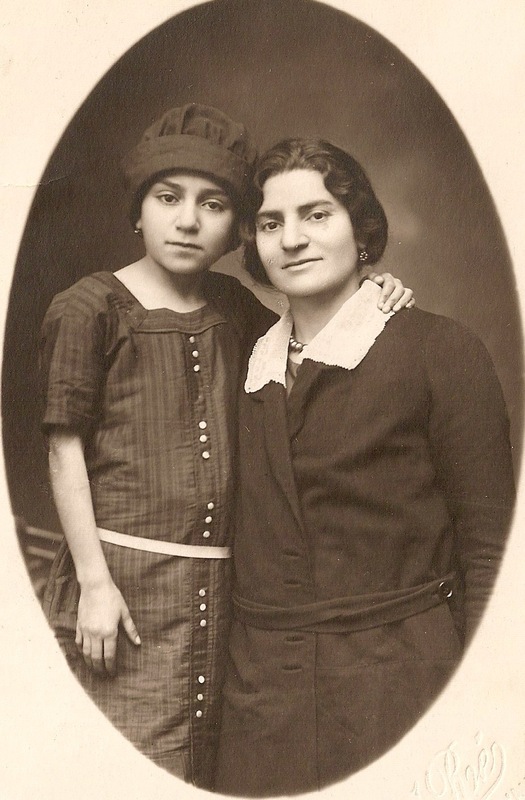 My great-grandmother’s sister, Teriz Echmelian, had already ventured to Providence, Rhode Island all by herself, a rebellious act in those days, and so had the uncle of my grandfather—his father’s brother—having settled in Cambridge, Massachusetts. My great-grandfather Nishan Guetchudian moved back to Yegheki in the Harput province leaving his home and occupation in Connecticut behind in order to marry my great-grandmother Haigouhi—his brother had sent him a photograph of an attractive, prospective spouse. Since he already had a taste of what life was like in America, he’d eventually heed his calling and move his family back with him. So it was inevitable that the two sisters and their families would have been reunited in the New World. My grandfather Hagop Rousyan (actually spelled “Russian”) had already been orphaned before the Genocide and was living on the streets, surviving on a diet of grass and weeds and toiling in odd jobs. Nevertheless, he was certainly impacted directly by the after-effects of genocide since it was impossible for him to return to his village of Sousoury, which incidentally was situated next door to Yegheki. But since his uncle had already found his way to New England, I presume he most certainly would have followed. My grandparents on my father’s side met in Aleppo, and there was about a 14-year age gap between them. Garabed Adanalian was born there, while my grandmother Luciné Mahakian and her entire family fled Urfa. Meanwhile, Aleppo was an ancient, attractive cosmopolitan city with opportunities abound, and there was certainly an Armenian community already flourishing there since the 11th century. In all likelihood, had there not been a genocide they probably would have wed since marriages were arranged in most instances. My father expressed his conviction to me while growing up that the Middle East, meaning the chiefly Arab countries, were simply a depot for Armenians as they had no place living there long-term due to the cultural and religious imbalance. Thus, I am certain that, one way or another, he would have found his way to the Boston area since he had contacts already residing there and was on a quest for freedom from a world with which he could never identify. Since I do believe that the concept of destiny is defensible, I am able to separate the events of 100 years ago from my identity as an Armenian and, more importantly, as human being. Having said that, my stance on destiny does not obstruct my obligation to contend with the past and somehow fathom the horrors my grandparents were made to endure. I’ve had to confront my people’s past for decades, at various times in intense scrutiny. Only recently have I begun to probe the details of the plight of my maternal grandmother, Clara Movsesian Russian, who turned 100 years old in October and still resides in her home of 70 years in Arlington, Massachusetts. But what would change if he did? When will the Turkish government succumb to its perceived legitimacy of denial and subsequently bring the Armenian Genocide to an end once and for all? Would reparations eventually follow? I’ve never been able to guess the outcome. Perhaps the Armenian Genocide will cease to matter to the world in 2016, and Armenian-Americans may begin to lose hope that their president will ever properly acknowledge it. I simply don’t know what to think. Unmistakably, the visit of the Kardashians to Armenia in April followed by the Pope’s public acknowledgement of the Armenian Genocide generated a worldwide fervor. The topic of the Armenian Genocide is being used as a direct way to spur business for media outlets. Everyone is talking about the Genocide, it has never received such attention on a mass scale since awareness was first spread about it 50 years ago. The magnitude of the worldwide attention, fueled by the numerous reports appearing in the New York Times, the Washington Post, the Guardian, the Independent, the Daily Times and myriad other widely read publications with millions of followers, not to mention the miraculous social media outlets like Facebook and Twitter, is unequivocal. The buzz that has been created is staggering, even overwhelming. It’s important that we separate the glamour, the Botox, the protruding bosoms and behinds, the haughty Hollywood lifestyle from the humanity of the Kardashians. Their visit was met with cynical remarks in social media. Some of my friends have been critical, believing that their visit has only cheapened or undermined the Armenian cause with all the ruckus. I cannot disagree more. They are human beings. They are connecting with their roots. They didn’t have to travel to Armenia for the centennial; they could have stayed home. They certainly didn’t need the publicity. And the Armenians have not lost anything. They instead should be proud that awareness of the Genocide and the Armenian nation for that matter has been placed under the spotlight. Average Americans now know where Armenia is located on the map, and they are now aware of the inferno in which the first Christian nation was engulfed 100 years ago. That’s something to celebrate ardently.